In order to append and respond to the assorted requirements of respectable clients, we are able to offer One Hole Mixer HU Spout C011. The offered range of one hole mixer HU spout C011 is designed utilizing high grade raw material and innovative techniques in complete adherence with the industry laid norms and standards. Along with this, the offered range of one hole mixer HU spout C011 is suitably inspected on different characteristics to maintain its authenticity throughout the manufacturing process. 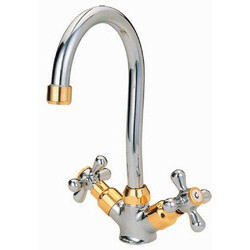 Established in the year 1972, Bharat Impex has earned a significant place for itself in the overseas market as a prominent manufacturer and exporter of Single Lever Mixers made of Brass and Zinc, Two Lever Bath Fittings and Bath Accessories. We have our own foundary where we control quality of Raw Material , own machining centers , good quality Polishing Unit , Inhouse Plating and Finally Assembly and Packaging . Company is managed by Professionals from India and Italy to bring the best quality product to the Global Market. d styles. The collection of our goods exhume utter sheen, smoothness and are long lasting. We are looking for export enquiries all around the world.